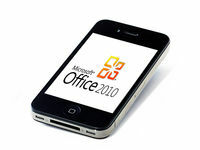 Microsoft would come out this year its Office suite of phones and tablets iOs and Android. Remember that this series of software already exists on Windows Mobile phones, and that there are Word, Excel, PowerPoint and OneNote, as well as dedicated access to Cloud (as SkyDrive and Office 365). The output of the following would be scheduled for November, when it also expects the version of Office 15 for PC. Between Windows 8, the new version of Office and a probable new edition of Windows Phone, the news is definitely a busy year for Microsoft.